Some of the loveliest views on the Ligurian Coast are those over the Gulf of Tigullio. And there, exactly where it should be, is the Excelsior Palace Hotel. 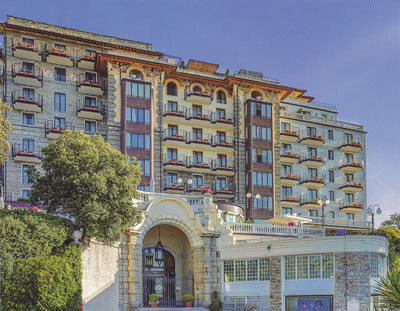 It was opened in 1901 as the Kursaal Rapallo, and through its doors strode many of the grandest people in Europe, including the Duke and Duchess of Windsor and King Farouk of Egypt. Part of the original building (which is prettily quaint) has become the current establishment’s health and fitness club. The rest of the building was re-worked and remains impressively large, for it houses 127 rooms. It would certainly not look out of place in Vienna. 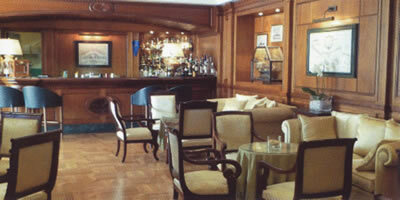 The public rooms are very pleasant indeed, for they are filled with fine oil paintings in antique frames. These portraits create an air of civilised opulence, which was reinforced for me when, in observing the tradition of tea in the afternoon, I found to my delight that the pot contained real tea leaves. (I really am beginning to tire of the ubiquity of the wretched bags.) This refreshment was enjoyed on the hotel terrace. Up on the sixth floor, room 620 was also entirely to my taste. It was a Junior Suite and therefore 1,227€ - 2,154€ a night, bed and breakfast for two, according to season. From its balcony the view of the sea and the coastline was simply ravishing, and I was happy to be ravished. The style of the apartment was, I think we might say, ‘Empire’ – for the mahogany furniture had ormolu mounts and the chest of drawers had a marble top. The curtains to the French window in the sitting room were operated electrically, which foxed me for a time, but not distressingly so. Double doors provided access to the bedroom. Mirrored walls cleverly increased the sense of space and period engravings in wooden frames on the walls added a sense of refinement. Two bathrooms were provided, one off the entrance hall and the other off the dressing area next to the bedroom. Both were clad with brown marble and both had a decent tub with a shower over, a loo, a bidet and toiletries by James Heeley. In the dressing area was that essential item for today’s traveller, the private safe. My dining at the Excelsior Palace was done in the Lord Byron Restaurant, a large and handsome chamber which afforded more views of the coast – which became prettier and prettier as night fell. The pink cushions in the wooden chairs gave good support to my back, as well as providing an aesthetically pleasing contrast to the beige napery. From the adjacent sitting room drifted in the playing of a very talented young pianist. The staff, in short jackets and back bow ties, lifted silver domes. All was well with the world. 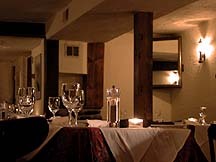 Two set meals of four courses are available at 60€ and 68€. My three courses from the carte were 74€. Chef Pasquale Giordano’s cuisine is straightforward and effective. I began with a local speciality, trofie di recco (twisted pasta), with pesto, potatoes and green beans – a good dish, well done. My meat was roasted loin of lamb with some excellent roasted potatoes. But the highlight of my meal was undoubtedly the pudding. This apricot mille-feuille, with cardamon ice cream and caramelised sea water, was luscious, tasty and tremendously satisfying. Well done, the pastry chef. 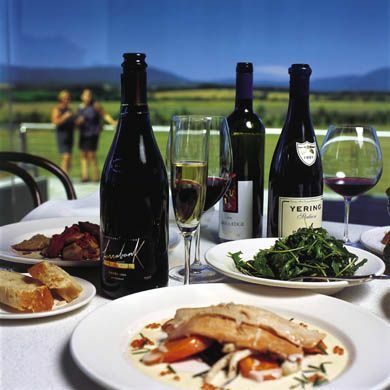 The wine list has 135 offerings, all of them Italian, except the champagnes. Prices run from 29€ for a Sicilian white (made from the grillo grape) to 320€ for the 2010 vintage of the Gaia & Rey chardonnay and 550€ for a magnum of 2011 Gaja barbaresco. Other bottles to catch my eye were: 2011 Tignanello (140€), 2009 Solaia (300€), 2011 Sassicaia (300€) and 2013 Cervaro della Sala (75€). Breakfast was back in the Lord Byron Restaurant, where the waiters – like the excellent Ali – looked after me with that solicitude and kindness appropriate to my age and dignity. They brought to me silver pots of coffee, buckets of ice cubes and, of course, the all-important concluding cappuccino. And from the buffet I secured comestibles of high quality – melon, pineapple, cooked ham, cheeses, bacon, tomatoes, toast and marmalade. This was a pleasant start to the day. Indeed, my whole visit was very pleasant. If you are minded to go to enjoy that remarkable view of the Gulf of Tigullio, the five-star Excelsior Palace Hotel awaits. Via San Michele di Pagana 8, 16035 Rapallo, Italy.